Yesterday was our youngest son's birthday and we took him out to dinner to celebrate. On the way home we passed the fire station near our house and all the firefighters were sitting outside, as they often do on summer evenings, and one of them was playing the cello for his lucky co-workers! Playing the cello. Do all fire fighters enjoy this sort thing on a summer night or is Madison special? Special. I thought so. Fire stations, firefighters, fire, heat, spicy foods - you see the connection, right? While we don't want to burst into actual flames, we do want a little fiery food to perk up the summer. At least I do. Spicy food makes you sweat, which in theory, anyway, cools you off. In my last post I mentioned eating Cajun mac and cheese at Hillside Quickies in Seattle and said I was going to try to duplicate the flavor. That mac and cheese was HOT and delicious. My version is also hot and delicious, but not as delicious as I wanted. In fact, I wondered if I should even post a recipe since I didn't think it was as great as the restaurant version. But now I can't remember exactly what the restaurant stuff tasted like, and this tasted so good that I've decided to just go ahead and post it. (And my husband said it was at least as good, maybe better.) Remember that it's really spicy and adjust accordingly. Cook the macaroni al dente according to package directions. Drain, reserving two cups of cooking water. Place the drained noodles in a bowl and toss with two tablespoons of olive oil. Add the chopped sweet red pepper to the noodles and mix together. Mix together the cayenne, crushed red pepper, black pepper, garlic, oregano, onion, paprika and oregano. Add to the noodles and mix. 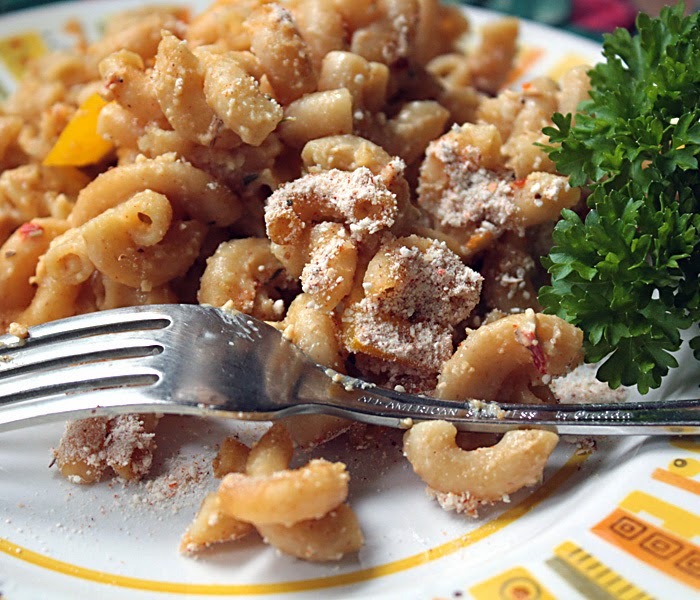 In a blender, grind the cashews to a powder. Add the yeast, chick pea flour and salt, and blend together. Add the water and lemon juice and blend until creamy. Add the blender mix to the noodles and mix well. Place mixture in a large, oiled casserole dish (approx. 10 x 13 x 2). Mix together 3 tablespoons fine dry crumbs, 1/4 teaspoon salt, 1 teaspoon paprika and 1/4 teaspoon cayenne, and sprinkle over the top of casserole. Spray lightly with oil. Bake, covered, in a preheated 350˚ oven for 15 minutes. Uncover and bake 10 minutes more to brown. Let sit for several minutes before serving. BTW, this tasted amazing cold the next day. Recently a number of bloggers, including me, had their blog content posted without permission or acknowledgement on duckducksoup.com. I found out about it because an alert blogger spotted Eat'n Veg'n posts on the site, and left Diann a message. I did some Internet checking and found that this sort of thing is fairly common and is done to attract hits to a site filled with ads in order to generate income. (google "splog" "splogging" "splogger") Following fellow-blogger Alisa's advice, I contacted the blog's owner and asked that the stolen posts be removed. She quickly complied. This sort of theft can have negative effects, which I won't go into here, on legitimate bloggers. I'm very happy to share my posts as long as it's clear that they are mine and there's a link back to my blog. The duckducksoup blog still exits with different content about how to get around various restrictions for posting ads and what to do about getting "flagged" etc. Interesting. We celebrate birthdays by going out to dinner also, and we have several to celebrate. That cajun mac sounds super delicious! I like that image of the firemen and the cello. 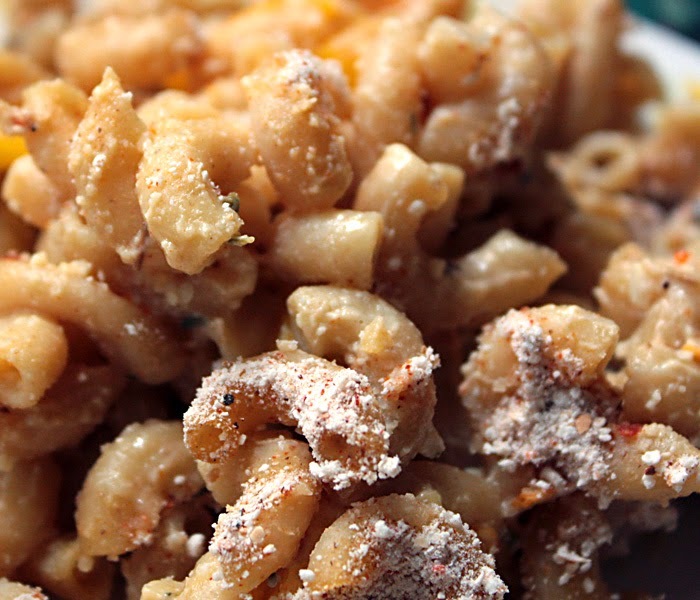 It's fantastic that you made your own version of the cajun mac and cheese. It looks and sounds super delicious. Do you think that eating spicy meals will bring the sun out? Because our summer is not behaving and it's raining all the time. Thanks, it was yummy, especially cold the next day! We celebrated two birthdays this week. even if it's 1/2 as good as quickie's recipe, it's still fantastic :). I'm going to put your recipe on my to do list. You are so right. That Quickie's mac and cheese was crazy. Next time I go I want to try something different, but I might not be able to.